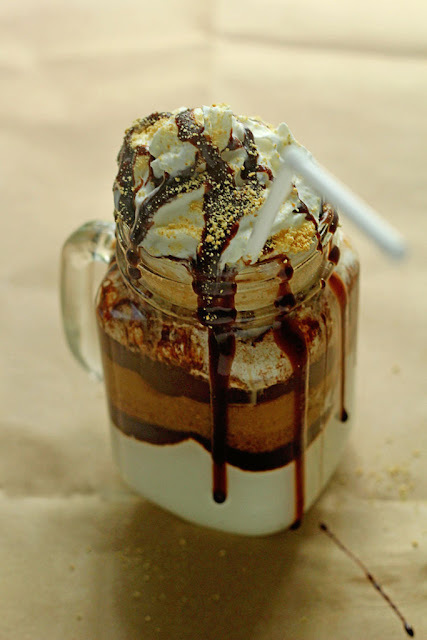 A delicious fun and fast S'mores Iced Coffee drink and tutorial video that is sure to perk up your summer mornings! Brew a k-cup of your choice using your iCoffee machine (8 ounces) and set aside. Add ice cubes to coffee to cool it down. Next add in milk or cream and sugar if desired and stir to blend. To assemble, add marshmallow fluff to bottom of your serving glass. Next add graham cracker crumbs then chocolate sauce. Pour coffee on top of chocolate and finish with whipped cream. Garnish top with chocolate sauce and graham cracker crumbs and serve.